A Bug’s Love | A Daily Dose of Zen Sarcasm! 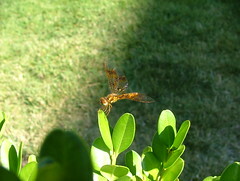 I'm pretty sure this is an Eastern Amberwing. It could also possibly be a boy Amberwing. The picture isn't the best, because I was on the wrong side of some rather spunky and prickly boxwoods –some of whose leaves manage to make a rather annoying appearance in this very picture. I am very happy with this picture. The little bug let me take it, and it was such a gorgeous, happy thing flitting about without fear of being splashed or squished by the little kids playing less than four feet away from said boxwoods. It was just so patient and giving, like a stranger who listens to your story, or like a friend who arrives at a timely moment in your life. It seemed to understand that it was made from something far more beautiful than the clumsy human rooting around in the box, following it with the unsteady hand. It seemed to know that I just wanted to look at it and admire its beauty a little and feel the smallest tinge of envy as I beheld his beautiful stained glass wings. Much love to you, little dragonfly. Thank you for sharing your beauty with me. 21 Aug	This entry was published on August 21, 2008 at 9:18 pm and is filed under Photoblogging. Bookmark the permalink. Follow any comments here with the RSS feed for this post. The bug is absolutely beautiful! Especially when I looked at the larger picture… Great shot! /shows up in a Raid t-shirt, waving a Black Flag, with a can of Off in his back pocket. What a fantastic shot! Nice work, lady.